The box for the game; a female Inkling is featured towards the top. 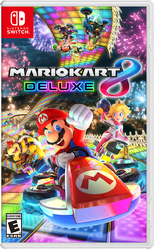 Mario Kart 8 Deluxe is a kart racing game released for the Nintendo Switch console. The game was first revealed as part of the Nintendo Switch Presentation on 13 January 2017 in Tokyo, Japan and is a port of Mario Kart 8, a game on the Wii U. A trailer was released for the game, which included a preview of Splatoon-themed content in the game. The game is the first in the Mario Kart series to include references and content from Splatoon. Mario Kart 8 Deluxe introduces Splatoon characters and other references to the Mario Kart series. Both male and female Inklings are introduced as playable characters, with three different costume variants each. A new battle mode course is introduced named Urchin Underpass based on the original Urchin Underpass stage from Splatoon as well as two Splatoon-themed ATV's, the Splat Buggy and the Inkstriker (heavily based on the Inkstrike). A new Inkling-themed amiibo costume unlocked by placing any Splatoon amiibo is also added. Orange ink, orange eyes, light skin, Studio Headphones, White Tee and Pink Trainers. Green ink, pink eyes, pale skin, Studio Headphones, Black Tee and Black Trainers. Pink ink, cyan eyes, dark skin, Studio Headphones, Sky-Blue Squideye and Cyan Trainers. Blue ink, blue eyes, light skin, Pilot Goggles, Zink Layered LS and Purple Hi-Horses. Purple ink, orange eyes, tan skin, Pilot Goggles, Choco Layered LS and Gold Hi-Horses. Cyan ink, brown eyes, medium skin, Pilot Goggles, Yellow Layered LS and Zombie Hi-Horses. The female Inkling racer on a Splat Buggy using a Blooper, which is also a squid. Hand-drawn artwork of the Inklings on Splatoon-themed karts. Inklings on Splatoon-themed karts on the Urchin Underpass battle course. An overview of an Urchin Underpass-themed course. Inklings (squid form) on karts. The amiibo costumes, including the new Splatoon themed costume. Mario Kart 8 Deluxe on Super Mario Wiki. This page was last edited on 18 February 2019, at 13:43.